With approximately 150,000 newly diagnosed cases of psoriasis each year, this chronic skin disease affects approximately 2% of the US population and causes considerable morbidity. (1) First-stage treatment of patients with moderate- to-severe psoriasis often starts with topical agents and then progresses to phototherapy (UVB) for more extensive disease. Extensive disease that cannot be controlled adequately with UVB treatment is then treated with second-stage agents such as psoralen plus UVA (PUVA), methotrexate, cyclosporine, or other oral medications. (2) In the past, PUVA and oral agents such as methotrexate have been viewed as effective outpatient treatments. (3) However, concerns regarding PUVA- induced cutaneous carcinoma and melanoma have restricted its use. Furthermore, long-term treatment with oral agents such as methotrexate have a number of systemic toxic effects. 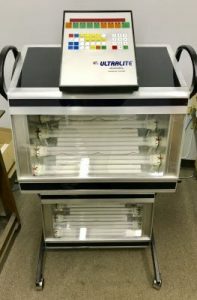 As a result, recent efforts to treat psoriasis have become geared toward a particular type of phototherapy known as narrowband UVB (Philips TL-01). Considerations regarding the administration of narrowband UVB phototherapy include the num- ber and frequency of treatments, as well as the dosage required. Dawe et al (9) showed that treatment 3 times a week for 40 days produced the same clearance of psoriatic plaques as treatment 5 times a week for 35 days, but with significantly fewer side effects from erythema. Another study demonstrated that narrowband UVB must be given at least twice a week to produce effective clearing. (10) The required dosage of UVB has been guided largely by dose- limited erythema. Traditionally, schedules have been aggressive. Walters et al6 showed suberythemogenic narrowband UVB is markedly more effective than conventional broadband UVB. Eleven patients were treated 3 times a week using a split-body approach for a total of 6 weeks. Clinical clearing was induced in 82% of patients after suberythemogenic doses of narrowband UVB, but in only 9% of patients with broadband UVB, and the schedule was tolerated by all patients. Biopsy specimens obtained at the end of treatment revealed that keratin 16 staining, a marker for epidermal hyperplasia, was absent in 75% of patients on the narrowband side, compared with none on the broadband side. The authors concluded that narrowband UVB offers several advantages over broadband UVB. These include faster resolution of skin lesions, a higher percentage of patients attaining clearance, and the ability to achieve these results with a well-tolerated suberythemogenic dosing schedule. (6) To date, there has not been a study that compares the efficacy of erythemogenic versus non-erythemogenic doses of narrowband UVB. This study used an anatomically shaped therapy bathtub equipped with a system for solution balneotherapy. The study used 10% Tomesa solution, which is an analogue to the ion concentration of Dead Sea water. It was combined with a light console and a reflector system that used TL-01 UVB lamps (narrowband UVB) located above the tub. All patients started with an initial therapy of 3 to 5 sessions per week for up to 35 sessions. Patients then received maintenance therapy for up to 35 additional sessions. An overall improvement of the mean PASI score was shown during the study (17.1 at baseline and 5.2 at the end of initial therapy). Most investigators (69%) and patients (79%) assessed synchronous balneophototherapy to be superior to previous treatments. In fact, 88% of patients regarded this therapy as pleas- ant and comfortable. (14) This statistic is particularly important when considering the management options for a chronic disease such as psoriasis, which necessitates multiple treatment courses throughout a patient’s lifetime. Narrowband UVB phototherapy has considerable advantages over traditional treatment options such as broadband UVB and PUVA. It is clearly more effective than broadband UVB, safer than PUVA, and well tolerated by patients when taken at suberythemogenic doses. Although new treatment modalities such as the 308-nm excimer laser have appeared promising in small-scale studies, optimal dosing and administration methods remain to be determined. 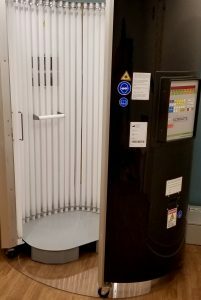 With superior ratings compared with traditional therapy and an ever-widening array of combination treatment options, narrow- band UVB has emerged in the new millennium as an established and effective treatment for psoriasis. 1. Christophers E, Mrowietz U. Psoriasis. In: Fitzpatrick TB, Eisen AZ, Wolff K, et al, eds. Dermatology in General Medicine. 5th ed. New York, NY: McGraw Hill; 1999:495-521. 2. Greaves MW, Weinstein GD. Treatment of psoriasis. N Engl J Med. 1995;332:581-588. 3. Coven TR, Burack LH, Gilleaudeau R, et al. Narrow- band UV-B produces superior clinical and histopatholog- ical resolution of moderate-to-severe psoriasis in patients compared with broadband UV-B. Arch Dermatol. 1997;133:1514-1522. 4. Goeckerman WH. The treatment of psoriasis. Northwest Med. 1925;24:229-231. 5. Parrish JA, Jaenicke KF. Action spectrum for photo- therapy of psoriasis. J Invest Dermatol. 1981;76:359-362. 6. Walters IB, Burack LH, Coven TR, et al. Suberythe- mogenic narrow-band UVB is markedly more effective than conventional UVB in treatment of psoriasis vulgaris. J Am Acad Dermatol. 1999;40:893-900. 7. Storbeck K, Holzle E, Schurer N, et al. Narrow-band UV- B versus conventional broad-band UV-B in phototherapy for psoriasis. J Am Acad Dermatol. 1993;28:227-231. 8. Green C, Lakshmipathi T, Johnson BE, et al. A compar- ison of the efficacy and relapse rates of narrowband UV-B monotherapy vs etretinate-PUVA in the treat- ment of psoriasis patients. Br J Dermatol. 1992;127:5-9. 9. Dawe RS, Wainwright NJ, Cameron H, et al. Narrow- band ultraviolet B phototherapy for chronic plaque psoriasis: three times or five times weekly treatment? Br J Dermatol. 1998;138:833-839. 10. Halasz CL. Narrowband UVB phototherapy for psoria- sis: results with fixed increments in skin type (as opposed to percentage increments). Photodermatol Photoimmunol Photomed. 1999;15:81-84. 11. Fredricksson T, Pettersson U. Severe psoriasis—oral ther- apy with a new retinoid. Dermatologica. 1978;157:238-244. 12. Gupta G, Long J, Tillman DM. The efficacy of narrow- band ultraviolet B phototherapy in psoriasis using objec- tive and subjective outcome measures. Br J Dermatol. 1999;140:887-890. 13. Simon JC, Pfieger D. Recent advances in phototherapy. Eur J Dermatol. 2000;10:642-645. 14. Schiffner R, Schiffner-Rohe J, Wolfl G, et al. Evaluation of a multicenter study of synchronous application of nar- rowband ultraviolet B phototherapy (TL-01) and bathing in Dead Sea salt solution for psoriasis vulgaris. Br J Dermatol. 2000;142:740-747. 15. Abels DJ, Rose T, Bearman JE. Treatment of psoriasis at the Dead Sea Dermatology Clinic. Int J Dermatol. 1996;34:134-137.